Raleigh Cadent 2 Urban Fitness bike is specially designed for mid-level fitness and is part of Raleigh Cadent 2 Urban fitness line. It is ideal for riding through the city while attending work or riding down the local greenway. They are modified for comfortable and quick rides supported by the availability of 700c wheels with a sporty geometry and flat handles. Raleigh Cadent 2 general sizes are Extra Large 6′-6’4″, Large 5’9″, Medium 5’6″-5’9″, Small 5’3″-5’6″. The bike arrives 85% assembled as they are partially disassembled for shipping. Raleigh Cadent 2 has 700c wheels making the ride quick and efficient. The 700c has a very high inflation rate with a thin profile. The thin profile and high inflation allow little contact on the road making it road resistance making it easier to make the wheel. Easier moving of the wheel encourages higher efficiency power transfer to the wheel saving the amount of energy needed to move forward. Raleigh Cadent 2 has flat handlebars that provide a cozier grip angle of the hands as it keeps the hand position down low and inline position with the stem. The low position enables the user easily forward and in a racy body position ideal for rising down on the pedals offering better visibility on the road. The flat bar handles offer a better splitting and standing up positions with the low and forward position pushing the weight from the hands onto the front wheel for traction. This bike sporty geometry making it comfortable to use. It makes it possible to change the degrees of the angles and be able to change the way the bikes handle the corners while going up and down the hills. 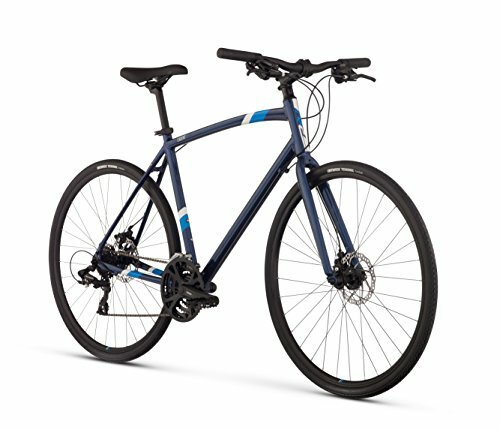 The Raleigh Cadent 2 Urban Fitness Bikes has 35c tires that are roll fast and smoothly. They are wide enough to provide traction enhancing an enjoyable and organized commute or ride. Shimano Tourney Tourney 3x 8spd shifters with 24 gears to select from enabling it to tackle any terrain making it ideal for all weather conditions. The Raleigh Cadent 2 fitness bike has Tektro Novela powerful mechanical discs that are easy to maintain boosting the confidence of navigating the city or taking an enjoyable beginner bike ride. The mechanical discs are great at stopping in all weather conditions. Raleigh Cadent 2 is well equipped with strong double walls wheels, 24 speeds Shimano drivetrain, rack and fender mounts that boost durability. Raleigh Cadent 2 is built with a light aluminum frame that offers a fun and lively ride that can make running the most mundane errands a pleasant experience. What are the advantages of owning the Raleigh Cadent 2 Urban Fitness Bike? Available in the medium size that accommodates most tall riders. From the features associated with the Raleigh Cadent 2, Urban Fitness Bike is ideal for fitness enthusiasts and cruisers as it has a sturdy bike ride and is solid and robust. The Raleigh Cadent 2 review available online is evidence of the reliability and durability of this good mountain bike. Raleigh Cadent 2 is worth every penny as it has great features supporting the speed it picks up when on a ride. It offers a great riding experience for everyday commuting and as a sporting fitness ride.